Charles Bukowski is more than just a poet or novelist, he is an icon, having gained rock star status in recent years. His creative lifestyle, heavy drinking and humor all have romantic appeal. On top of that, Bukowski was remarkably quotable, coming out with numerous pithy and witty statements in his novels, poetry, and in interviews over the years. Choosing my favorite t-shirts was fun. I picked 5, but there are many more for sale at Amazon (and indeed at other places). 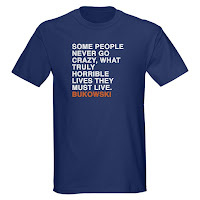 I hope that you enjoy seeing my selections for the 5 Best Charles Bukowski T-Shirts. Pee in the sink infant onesie Forgive me, but I have to say that I think this is the best Charles Bukowski t-shirt of them all! For younger Buk fans, this is an infant onesie featuring the Buk quote: “Sometimes you just have to pee in the sink,” written across the front. You can buy it in several colors but the pink works well for me! My only disappointment is that they don’t do one of these shirts in my size! Some people never go crazy quote This Charles Bukowski t-shirt features his: “SOME PEOPLE NEVER GO CRAZY, WHAT TRULY HORRIBLE LIVES THEY MUST LIVE” quote, using white writing on a dark background (the t-shirt is available in navy blue or black). One of Bukowski’s impressive traits was his skill at expressing himself through the use of accessible writing, often employing decptively subtle techniques, as well as humor. One for the ladies. 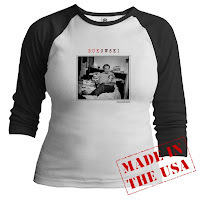 This contoured raglan sleeve women’s shirt shows a Sam Cherry photo of Bukowski on a bed with a babydoll on the front. It’s a strange but amusing image. The shirt is produced by American Apparel and made of 100% superfine combed cotton. Available in baby blue and white, or pink and white. The shirt is made in the USA. I'd rather be reading Bukowski t-shirt Another simple but effective design, this shirt says: “I’d rather be reading BUKOWSKI” in black letters on a white background. It’s difficult to summarize my own feelings any better, given the joy that I’ve got from reading the great man’s work over the years! The white t-shirt is preshrunk and made from 100% cotton. The t-shirt advertised is a large adult one, but they come in other sizes too. I'll right away grasp your rss feed as I can't to find your e-mail subscription link or e-newsletter service. Do you have any? Kindly permit me realize in order that I could subscribe. Thanks. Visit overflow call answering for best Call Answering. As you choose from the yachting shirts that are available in the market, there are different considerations that should be taken into account. The style and the design, including the color will prove to be important. The same thing is true in the case of material and brand name. With such, some of the possibilities recommended in the best yachting shirts will be identified below. Looking for best stylish vintage T-Shirts design ? Vintage retro style is all about digging into what you like. Choose your best own. Looking for Old School Tees ? Then we are the best for you, who suit your expectations and budget. We have huge collection for T shirts item. We provide you best quality & hopefully we makes smile on your face. Nice t shirt post thank you. Was Charles Bukowski a Misogynist? See "legal" in sidebar for copyright info. Theme images by Ollustrator. Powered by Blogger.